LINES will help you save time and money during your Walt Disney World trip. We created Lines to help figure out where to go and what to do during your Disney vacation. 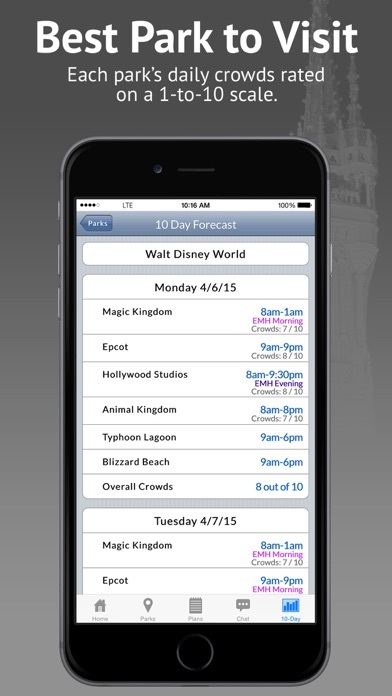 No other app – even Disney’s official app – gives you as much unbiased advice about the Disney parks. LINES features include: - Advice on which parks to visit and avoid for next 10 days. - A CROWD CALENDAR showing you how busy each park will be over the next ten days. - Customized step-by-step TOURING PLANS for each Disney park. You tell Lines which rides you want to see, and Lines will display a step-by-step itinerary showing when to see them to avoid long lines. Lines can even update your plan while you’re walking around the park! It’s like having a GPS for Disney World. - When you’re in the park, Lines will display Disney’s currently posted wait time at every attraction and how long you’ll REALLY wait in line, based on our experience and that of thousands of families on the same ride. Only Lines gives you this “actual wait” estimate. 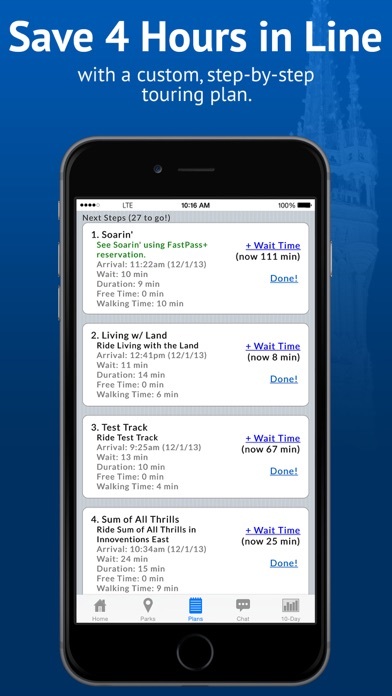 - Disney’s official app doesn’t show you the waits for many attractions or character greetings. Lines has wait times for more rides, shows and character greetings than even Disney’s own app. - Only Lines will predict the wait times and FASTPASS times for the rest of the day. This is incredibly useful if you’re trying to plan your afternoon and evening, if you want to know whether FASTPASSes will be available at Splash Mountain after your nap, or if trying to decide which park to go to after dinner. - Complete schedules for each park, including opening and closing times, parades, fireworks, shows and character greetings. - Accurate MENUS and PRICES for every restaurant, kiosk, food stand and cart across all of WDW – more than 12,000 things to eat! Every menu is searchable – you can find every steak in Epcot or around Walt Disney World! - LINES will show you exactly which things in each restaurant and store count as a snack in the Disney Dining Plan. Our Disney trip planning tools have been featured in USA Today, the New York Times, FOX News and dozens of other newspapers, magazines, television and radio shows. Since 1986, we’ve helped more than 3 million families plan their Walt Disney World vacations. Note: Some LINES features, such as the crowd calendar and wait times, require an in-app subscription purchase to access. Other LINES features, such as customized touring plans, menus and chat forums, are completely free. Your in-app subscription includes 365 days of access to TouringPlans.com, the Web’s most popular subscription-based site for Disney trip planning. I can't imagine an app more useful and fun. It’s the best Disney planner with the best community! Lots of functionality from 12 month out checklist to actual room location suggestions and auto room request. Has advanced dining alert if you are trying to get the hard to get one-and it has the best community to ask questions. You won’t be waiting in 2 hour long lines if you use this app and do your homework! We have gone twice with our little kids and we’re headed back in May again and we LOVE touring plans and WDW Lines as our go to help in planning our park day before and while we’re there!! I recommend it to everyone I know going! Honesty, the price of an annual subscription is misleading. Looking at Disney prices, you are thinking how can something so cheap be worth it for planning an expensive vacation. Frankly, it is worth 10 times the money at least. We went in Oct of 2017. I planned for my family and for my in-laws to meet us at the parks for a few days. The planned worked perfectly! (So much do doing again in Oct 2019.) This is essential and it works! The only way to do Disney! This app is wonderful! Checking the wait times and having the Touring Plans recommendations of when to ride and when to wait is so helpful. 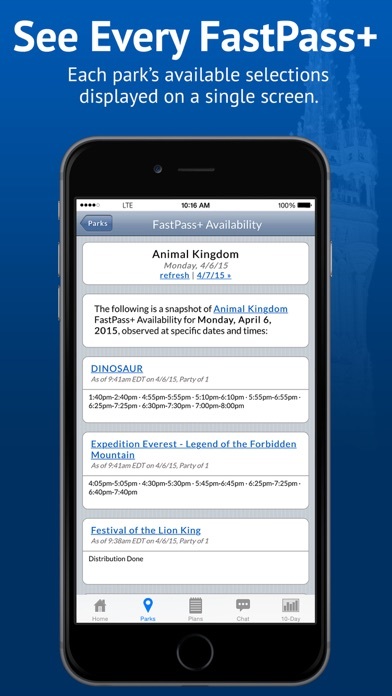 When you use this app you have the information you need to have an enjoyable time in the parks. less waiting, more fun! We just returned from our trip to DisneyWorld. I used the website and the app to plan our days at the parks. Despite the crowds, we were able to ride on most of our favorite rides without a long wait. I highly recommend this app! Trip to Magic Kingdom was magic ! We input our must do attractions at MK and we waited no longer than 20 minutes in a line ! And we were able to do 23 attractions !!!! !This gives you a touring plan to have a great day ! 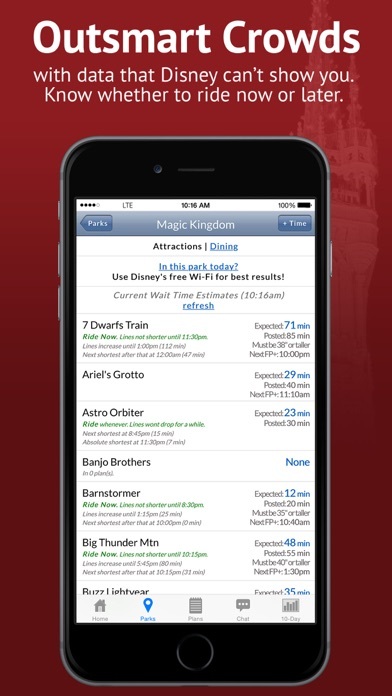 It updates ACTUAL ride times faster than the Disney app. The best in the business bar none. Exceptional value. Worth every cent of the inexpensive subscription. Changed our last three Disney Trips in immeasurable ways. Thank you! The recommendations/plans provided by this group are top notch and will help ensure a great vacation. The user experience/outdated application will frustrate and annoy you. 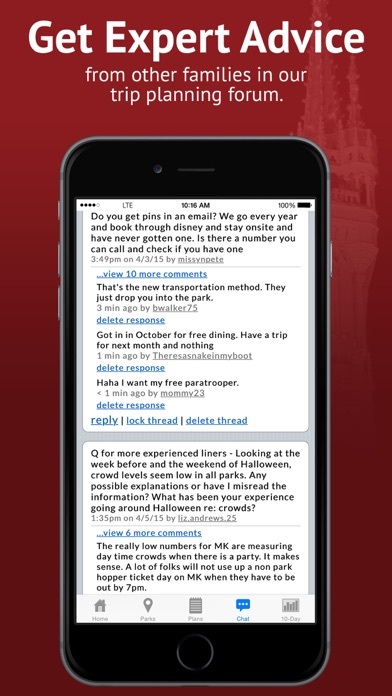 A modern application with current design/interaction patters would be a wonderful addition.